Since November 2004, former New York Mayor Rudy Giuliani has consistently led Arizona Senator John McCain for the Republican presidential nomination. 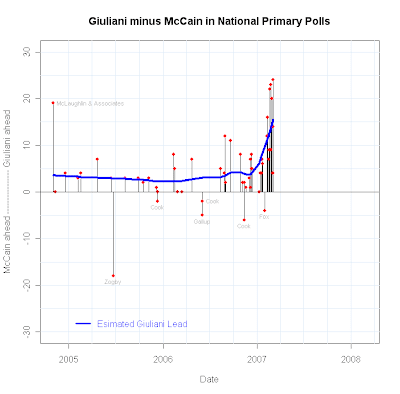 Giuliani has led in 46 of 57 national polls since then, with 5 more polls tied. McCain has led in only 10.5% of all polls. In the last two months, the size of that lead has increased substantially. Only in the last month (and especially the first week of March, when these data end) have reporters responded to the polling data, but in a somewhat misleading form. A number of reports have framed the increased support for Giuliani as a surge from behind, when in fact he was leading all along, albeit by a small margin. 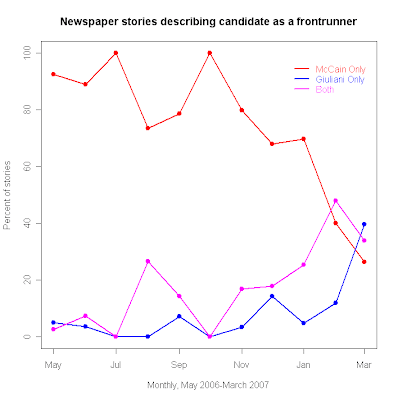 Yet that small margin was quite consistent if reporters had bothered to look at the data. A clear reason for this emphasis on McCain has been Giuliani's slow start on staff and campaigning. In addition reporter's (and informed observers') view that Giuliani's social issue positions represented a large barrier to obtaining the nomination, has led many to discount the import of the polling lead in characterizing the race. And indeed, these may ultimately doom his campaign. But that isn't what the data say now, or have been saying for over two years. But the recent polls should serve as a warning that sometimes you should pay attention to the data. The apparent surprise at Giuliani's recent lead, expressed in many articles, should not be so surprising at all if the data were taken seriously. I am not making an argument that Giuliani's lead now is a prediction of the future. I AM saying that to understand political dynamics you must look at them in the context of all the evidence, in this case all the polling data. Reporters would produce better informed stories if they did so.